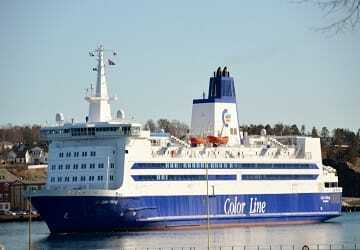 Color Viking was built in Denmark in 1985 and was previously known as the Stena Invicta is a ferry owned by the Norway-based Color Line. Color Viking is certified to carry up to 2000 passengers and 370 cars in its garages and features numerous facilities for all ages to experience during the crossing. Onboard you’ll find a bar, café, buffet restaurant, kids club (during holiday season), and various shops some selling duty free items such as perfumes, cosmetics and fashion wear. There aren’t any cabins onboard the Color Viking, however you will find comfortable seating throughout the vessel. Breakfast, lunch and dinner is served in the buffet restaurant offering hot and cold dishes, so whatever time of day you are travelling you could grab a bite to eat. If you would prefer something lighter the café next to the childrens play area serves sandwiches, baguettes, fresh salad and baked food. 8 Glass Bar is the perfect place to purchase an alcoholic beverage onboard the Color Viking, offering passengers a place to relax, enjoy a beautiful view of the ocean and listen to some live music. The ship is wheelchair friendly with disabled parking available close to the lifts. Please Note: Whilst we have taken great care in making our Color Viking guide as accurate as possible, onboard facilities, services and entertainment may vary depending on the date and time of year that you travel, facilities mentioned may change without notification and ferry companies reserve the right to operate vessels other than those mentioned at time of booking without prior notification.